The Brothel is run by Madame who encourages her patrons to "Do come again..."
A brothel is a very nice word for a place where women live and work with men in need of momentary companionship. For this service, a nominal honorarium is paid. It is a place existing to soothe the needs of heterosexual men, and once serviced, they will not force themselves on their women folk in ways of which people of quality do not speak in public. Because of this, some may say that a brothel is an ugly place. 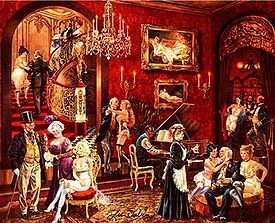 True; too much red flocked wall paper, too much gold gilt on the furnishings, and too many women smoking cigars may not make for the most tasteful of places. But these decorations are needed to remind men that they are in a place of business. The Brothel is a place where relief is given and ministrations are performed under the watchful eye of a titled gentlewoman, who is known simply as Madame. The Madame, a woman who is always of gracious breeding and impeccable business sense, understands that from time to time her business may be in the news. Because a Lady's name should only appear in the newspaper upon her marriage and her death, the Madame prefers to keep her real name to herself thus protecting her family from any potential embarrassment. 1 The Chinaman would be proud! 2 Welcome, sir, may I take your hat? 4 Three squares a day, and laundry service, too! The Chinaman would be proud! What separates a brothel from a run of the mill house of ill-repute is that in a brothel, the smoking of hashish is not only permitted, but encouraged in its own room, the Opium Den, which features an all you can eat Chinese buffet until 3:00am and free dry cleaning 24-hours a day. Welcome, sir, may I take your hat? As you can see there is nothing going on here that hasn't happened in your own mother's parlor. Upon entering the Brothel, the man checks his coat and fedora by a well spoken black person. 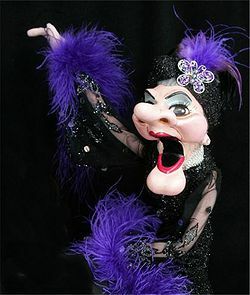 The Madame interviews many older black people, but only the ones who sound more educated than the average white person get to greet visitors at the front door. After being greeted by the Madame, the gentleman makes a discrete contribution to the Brothel's electric bill fund, equal to the value of the amount of electricity that the gentleman will consume during his stay in the building. With that out of the way, the gentleman may either choose to visit with a woman of his liking, or the Madame can provide him with one of various stunning, and cunning, conversationists. One may select any number of vivacious women with whom one may spend the evening, or remain just an hour or two. These carefully selected and discrete women all excel at the art of French conversation, dramatics and other gentle talents. Once the customer and the female employee are introduced, a drink is shared in the formal parlor, and in the company of other couples who are acquainting themselves with one another. Perhaps the woman will play a little ditty on the pianoforte ("Do you know Three Blind Mice? "), and then, once the relationship has ripened into one in which confidences can be shared, the two adults excuse themselves to conduct their own personal salon in a private room. While upstanding people in the community may think that what goes on in a brothel is immoral, nothing – we mean: n-o-t-h-i-n-g – could be further from the truth! Every room has a Gideon's Bible, or has been stayed in by a Bible salesman. "We will begin by the laying of my hands upon your afflicated organ." "Kneel before me, my child so that I may anoint you..."
"You are a wicked, wicked man..."
"Sweet merciful Jesus, here I come!" Three squares a day, and laundry service, too! See that couple in the back? They're canoodling. Many of the young women who are employed by the Brothel would have no other place to go if it were not for the kindly Madame. In fact, many of them have been sent forth into the world by their parents who have tried and failed to get these "wild children" under control. Under the watchful eye of the Madame, these girls have ripened into womenhood. They have learned skills that many men desire in a conversationalist. While many domesticated wives live for the drudgery of laundry, cooking and diaper dipping, the women of the Brothel live for song, dance, good food and carefree pleasures afforded to those who have servants and other staff at their beck and call. Unburdened of menial tasks, the women of the Brothel have time to hone their skills, practice flexibility and tonsil hockey, the official sport of the sporting life. They are educated in French arts, as well as the lost arts of the Greek poetess Sappho who sang the joys of eating tacos. Periodically, field trips to the Halls of Government are to be had. While on these unplanned trips civics are taught, and punishment is meted out for those who have behaved in an ill-fashion. However, such trips are brief and soon these women are returned to what they do best, accommodating the needs of upright male citizens of the community.